Perhaps there is a reason why we don’t have Barnavave featured on this site – although I expect we shall be reading one soon. Everything about the Southern Cooleys is exactly unlike everything about their closest neighbours, the Mournes. Their proximity, would indicate some kind of kinship, but these quirky, unusual hills have more in common with the Southern Highlands of Scotland. False tops, flat bogs, grassy approaches with naked rock summits. However as much as the Mountains of Mourne sweep down to the sea, so do the Cooleys, so the snoberatti di collini have to bite their tongues when prattling on about Munros, Marilyns and such (who kick off in the main, many hundreds of feet above sea level) in case someone quotes Slieve Foye or Barnavave, both summit spot heights achieved every single inch from sea level. A mad dash at Slieve Foye – literally out of the middle of Carlingford - will get you into a fairly tough pull up some generous terrain to its rocky top and a trig point. 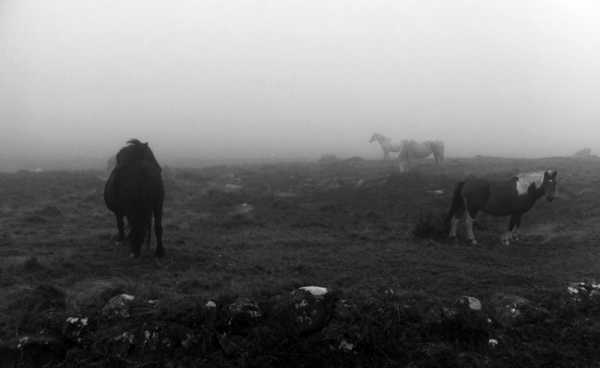 Strange half-feral horses populate its southern slopes and the boggy ground below. Completely heart-melting vistas of beautiful Carlingford, the lough and North to the Mournes, fill the skyline. It seems here you have the magic of northern hills with none of the murkiness of northern politics. Just to compound the point, it is here, beneath Barnavave, a ticked-off Queen Medbh, hunting the bo from the Tain Bo, stopped, had a few pints and showed her bare arse to the North. Plus ca change ….